Why do kids have more infections? And why do they “grow out” of them? Let’s start with the anatomy. When kids experience pain, it is usually because of pressure built up behind the eardrum in the inner ear canal, also called the Eustachian tube. 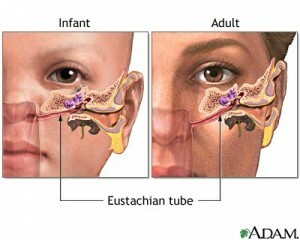 In children, the Eustachian tube is a slightly different structure than in adults. First off, it is at a horizontal angle, making it more difficult to drain on its own. Also, it’s narrower so it takes less fluid buildup to create discomfort. 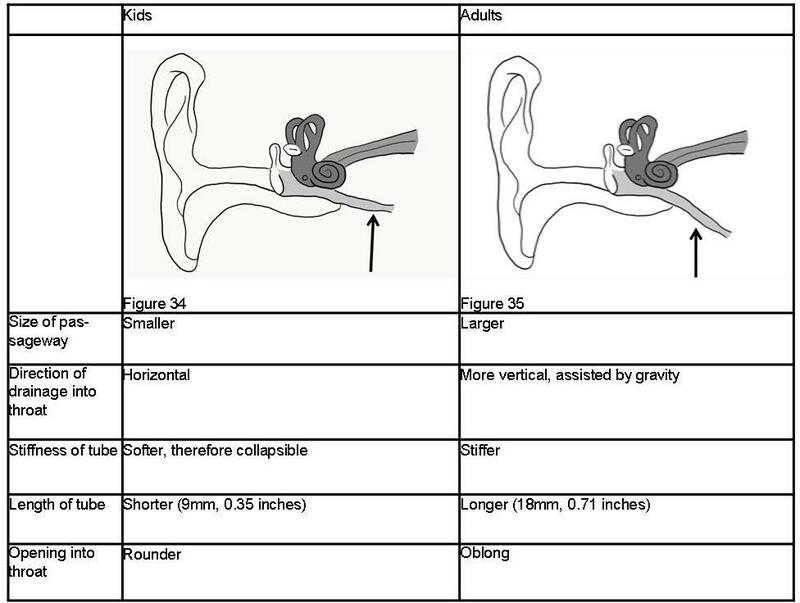 By understanding the structures surrounding the ear, we can then fully appreciate additional modalities that can help the ear drain on its own, helping your child feel better sooner. We’ve had parents mention that the child is asymptomatic and goes in for a well-child check. The pediatrician looks in their ear and sees redness and inflammation and diagnoses an ear infection. The action step is usually a recommendation of antibiotics. Teething can create extra inflammation to the area as a new tooth emerges through the gum. 2) Does the child have symptoms of a cold? Is the mucus clear or green? 3) Does the child have undiagnosed food intolerances? If a child is constantly eating a food protein(s) that causes inflammation, the site of the problem can occur in the sinuses, back of throat (think tonsils and adenoids) and inner ear. Food intolerances look like so many different things so it can be difficult for a parent to discern. There are food sensitivity tests available, muscle testing as well as elimination diets. Some signs and symptoms include: dark circles under the eyes, decrease in rate of growth, digestive issues such as constipation and/or loose stool, skin conditions such as eczema and dry bumps and numerous other issues. This is why we ask so many questions when parents bring in their kids – we are attempting to help you put the puzzle pieces together! As parents, none of us want to see our child uncomfortable. So the question is: when our child has ear pain, what can I do to help them? Try a chiropractic adjustment! How can chiropractic help ear infections? Let’s talk structure. Take your first fingers and find your ears and go directly down from there. You’ll be in a divot behind your jaw and right in front of another bony structure, your skull. Now push in. That is your first vertebra. You may notice that one side feels tender or that one side feels like it’s sticking out more than the other side. Chiropractors assess the motion of the spine or vertebrae as well as if there are any muscular changes such as muscle spasms. Not always, but pain may accompany the area as well. The first vertebra’s (also called the atlas) close connection with the Eustachian tube can influence how well it is draining and in the case of ear pain, the first vertebra is often not moving optimally, creating dysfunction. Patients often feel instant relief following an adjustment that allows the Eustachian tube to drain if pressure is built up. We even have kids tell their parents “My ear hurts. I need to see Dr. Angie and Dr. Robyn”. If an infection is present, chiropractic has also been shown to increase the activity of white blood cells, the cells responsible for removing harmful microbes. Read the study here. This study definitely shows that we need more research on how we can increase the strength of our immune system. If a child has recurring ear infections, it warrants further investigation. At Family Focus Chiropractic, we have extensive knowledge in the area of food sensitivities, which we see frequently in kids that have enlarged adenoids, recurrent ear pain and when they are “always sick”. This is a more plausible cause when the child experiences ear inflammation throughout the year instead of just the winter when kids are more likely to experience colds. You can read more on the topic here. If your child is tugging at their ear or complaining of ear pain, consider having them evaluated by a Chiropractor to help boost their immune system, improve ear drainage and allow the body to heal.